Please also visit the Virtual Wilbye Consort and Virtual Byrd Choir sites. 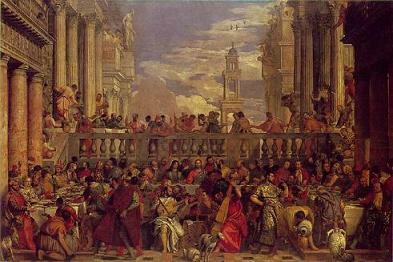 Paolo Veronese: "The Marriage at Cana"
使用楽譜：Marco da Gagliano: Madrigals, Part 1:Il primo libro de madrigali a cinque voci (Venice, 1602). Edited by Edmond Strainchamps. Recent Researches in the Music of the Baroque Era, vol. 124. Madison, WI: A-R Editions, Inc., 2003. Used with permission. このほか全6巻を網羅した次のエディションもあります。Marco da Gagliano: The Complete Five Voice Madrigals edited by Suzanne Court, published by GAUDIA Music and Arts, Inc., New York.